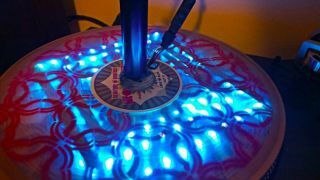 Remote-controlled, LED-filled vinyl records now exist | What Hi-Fi? A world’s-first, you'll be staggered to learn. US record label Romanus Records has lived up to its commitment to release unique forms of vinyl, with the likes of tri-colour, glow-in-the-dark, and sand-, glitter- and beeswax-filled vinyl pressings. How, you ask? As the label’s boss Chris Banta told Team Rock, “[I] couldn’t figure out how to get power to the LEDs without implanting a battery — which would eventually die — or a giant standard AC power pack. Plus, I could only figure out how to get power to one side. The album comes with a remote control, USB rechargeable battery pack and USB connector.